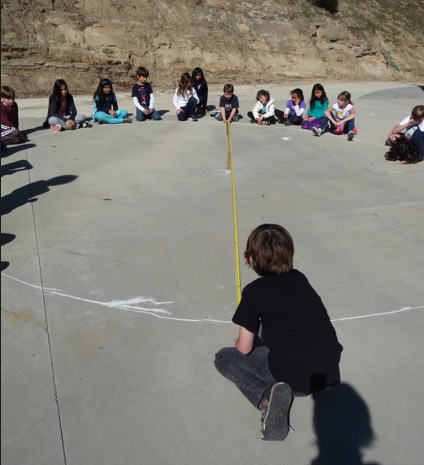 Mrs. Yollis' Classroom Blog: Circle: Radius and Diameter Exploration! today we learned about circles. 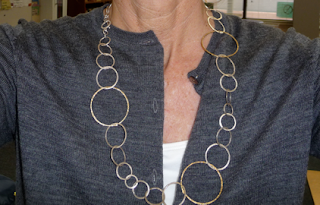 Mrs. Yollis' necklace was made of CIRCLES. The playground had many CIRCLES. 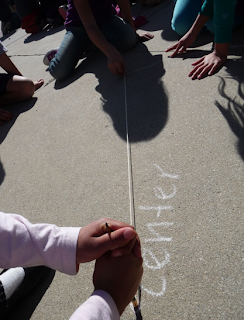 We learned that circles have a center point. It is the same distance from anywhere on the circle. In addition, we learned that a line segment drawn from the center point to the outside edge of the circle is a radius. The diameter is a line segment. It passes through the center and has endpoints on the circle. After the vocabulary lesson, Mrs. Yollis' students were ready to make their own CIRCLES. 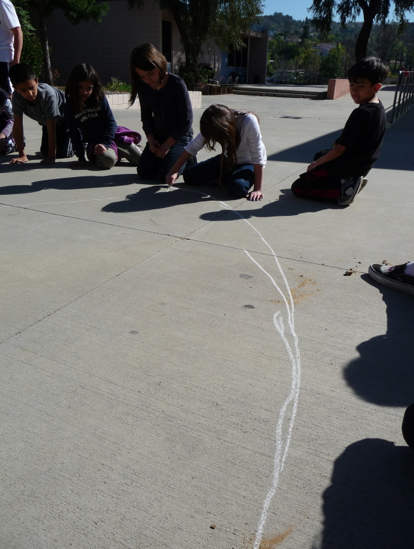 Chalk was tied to a piece of string. The string was the RADIUS. We also created a radius with a length of 3 yards! One student sat in the CENTER. We pulled the radius tight, and students pulled the chalk around the center. QUESTION: With a radius of 1 yard, what was the diameter? ANSWER: A circle with a 1 yard radius will have a diameter of 2 yards. The bigger circle was much harder to make! It had a radius of 3 yards (9 feet). It was hard to keep the radius pulled in a tight line segment. We had to restart at times. Keep dragging the chalk around the center point! Finally, we were were able to complete the circle. 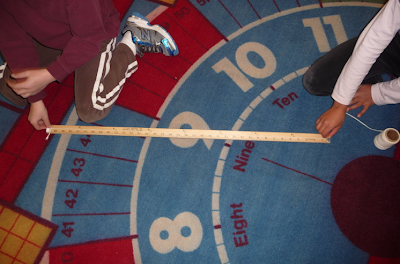 It was time to measure the diameter! ANSWER: The circle with a radius of 3 yards has a diameter of 6 yards. 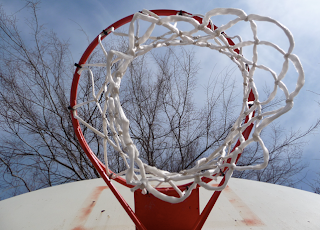 Some students confuse a flat circle with a 3-dimensional sphere. Take this quiz to see if YOU know the difference! Were you able to create a perfect circle in class? I read this post with great interest for when I was in primary school we attempted to draw a huge circle with no luck as well. However on a smaller scale just like you guys we had more success. Another way we attempted to draw a prefect circle was by laying the flat tip of your pencil on a piece of paper then by pulling the piece of paper in a circler motion hopefully you would have drawn a prefect circle. On my white board in my room today, I was practicing my circles. I used two expo markers, one as the center point and the other to draw the circle. It didn't come out very well! The paper clip method we used in class worked really well for me. My circle was almost perfect! I tried AA's method and even saw a video on line that showed the same thing, but I wasn't able to draw a good circle. Great work comment and well done for having a go. I feel that the only way it would work for you Leila is if you make your circle rather small and then just build up the different sizes of circle you would like to draw. Good Luck! I have to say the easiest way for me to draw a perfect circle is to trace the bottom of a round glass bottle. Great comment! I was never good at circles, just like you. My hand is not that steady. I start out well, and then, BAM! My hand slips. I also like the paper clip method. It is more challenging than just to trace a cup or a circle, but it is still fun. After a lot of practice, I think I will get the hang of it. What a wonderful and informative post! We will be studying geometry next term and I know the 2/3s will find your post very helpful. It must have been a lot of fun making those huge circles. As I looked at your pictures I found myself wondering how many students would fit in each of the circles. Do you have any helpful tips if we decide to give this a try later in the year? Shapes and calculating circumference, perimeter, radius, area, diameter have always been fun activities for me. 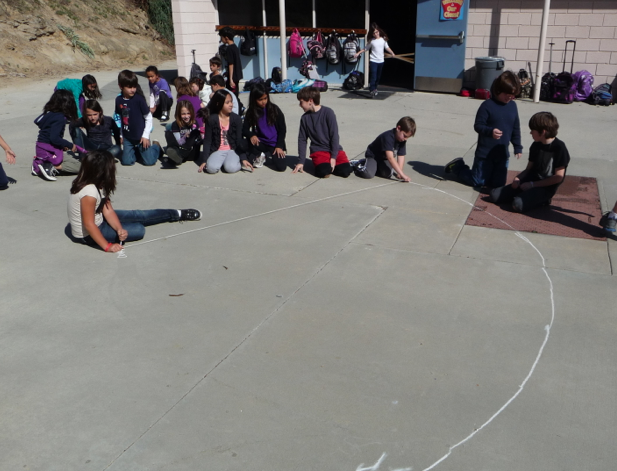 Like your class, I would often try to make and find shapes around the school to help discover the properties of shapes. Did you know the circumference of the Earth at the equator is said to be 40075.16 km or about 25047 miles? If we look at the circumference through the poles, the circumference drops to about 39999 km or 24999.5 miles. Because there is a difference in circumference when measured through different points, it shows Earth isn’t a perfect sphere. A slice through the equator might look like a circle but through the poles it would look like an ellipse (slightly flattened not quite a circle). We all know our Earth spins on its axis. It takes one day to do a complete turn. In fact it’s that turn that gives us our length of day. That spin moves the Earth’s surface around into and out of the sun’s light giving us night and day. The spin also flattens the Earth a little as the equatorial regions feel more of the force of the spin. Have you ever been on a ride that spins you quickly around in circles? Did your feel yourself being pushed out? I have been helping create professional development throughout my district and was asked for ideas for math at the elementary level. I knew I was going to come search Mrs. Yollis' blog for ideas, and am so happily surprised that you have such an amazing example as your most recent post! This is truly inspiring to see your joy in learning. My favorite way to create a perfect circle is with a paperclip, and two pencils. Can you guess how I do it? What a great idea. Getting to work on circles as a group like that would definitely help me to learn all about the radius and diameter! When I taught fourth grade I used to play a game where we would go outside and while listening to music, we'd all dance in a big circle. Then, I'd call out someone's name and then either radius or diameter. If I called out radius, they had to dance to the center and back. If I called out diameter, they had to dance all the way across to the other side. It was always so much fun! One other thing I noticed was that you're all wearing t-shirts. I have to say, I'm extremely jealous of that! Even though we've had an unseasonably warm winter so far here in Massachusetts, there's no way we could wear t-shirts. I probably won't be able to wear my first one until about April! I have enjoyed reading your Maths posts - what a great way to learn, you have really got to grips with your subject there! It made me realise that I rarely post about maths on our class blog, and I SHOULD! But don't find it easy! You have inspired me to have a go at putting at least one Maths post on next half term! Also some super ideas and comments from Mr Avery, Mrs Watson and Mr Mannell - thanks all! I am Ellie's Grandmother and I have been teaching children all my adult life. I want you to know how very lucky you are to have a teacher like Mrs. Yollis. When people research how students learn best and even more importantly how students retain [remember for a long time], they found out that physically doing something while you learn makes it really stick in your brain. You are studying geometry which can be really hard, BUT because Mrs. Yollis is having you draw together and measure together and redo your work until it is right, I bet you will remember this lesson forever! Thank you for sharing your lessons on your Classroom Blog. Your learning looks like so much fun it makes me want to learn with you! Keep having fun while you learn. Thanks for the wonderful comment. 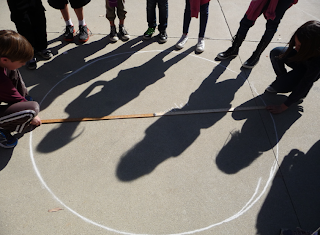 When did you start teaching about circles? I love drawing circles, radii, and diameters. Mrs. Yollis showed us how to draw a perfect circle. Did you like to draw circles, radii, and diameters. Mrs. Yollis showed us how to draw a perfect circle. All you have to do is take a paper clip and two pens or pencils. Make a center and put one of the pens on the center and the other pen on the end of the paper clip and drag it like a circle. Oh such a wonderful blog .I learned and enjoyed to know Definition of a Circle .You have explained it in such a nice way .Thanks for that . It sounds like you participated in some very interesting math activities. As a former math teacher, I share your interest in circles, diameters, and radii. I would like to know if your class has any plans to celebrate Pi Day on March 14. My class frequently celebrated Pi Day with a brief history of pi, pi poems ("paiku"), a pi recitation contest, and calculating pi through measurement. And of course we would always end the day EATING PIE! Keep up the great work and I look forward to seeing more math activities on your blog in the future. Thank you for commenting on our blog! Our class has never heard of pi before but Leila's sister taught her it in second grade. You are very lucky that you get to eat pie after. It seems delicious. 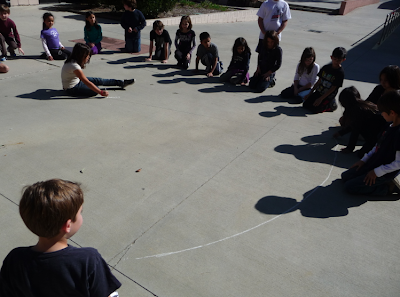 We learned that a circle has point, radius, and diameter. 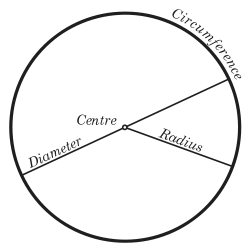 A diameter has two radii. We also learned about polygons. A polygon is a closed figure with straight sides. The square is the star of the show because it is a rectangle, rhombus, and parallelogram. Awesome way of teaching children about geometrical figures.Circle is one of the most special figure out of plane figures.Its due to its uniformity and every point on its circumference is at equal distance from the center.